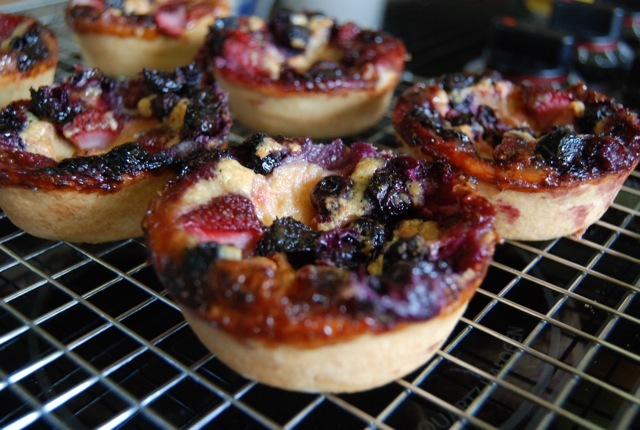 These aren’t the prettiest tarts I’ve ever made, but they’re certainly some of the tastiest. And as I’m always reminding my daughters, it’s what’s INSIDE that counts! These are my low-sodium tribute to the Fourth of July (hence the name) but can be made year round with whatever fruit’s in season, peaches and plums, blackberries, you name it. Although the dough is from scratch, it doesn’t take a pastry chef to prepare. Simply whiz it together in your food processor, roll out and cut. 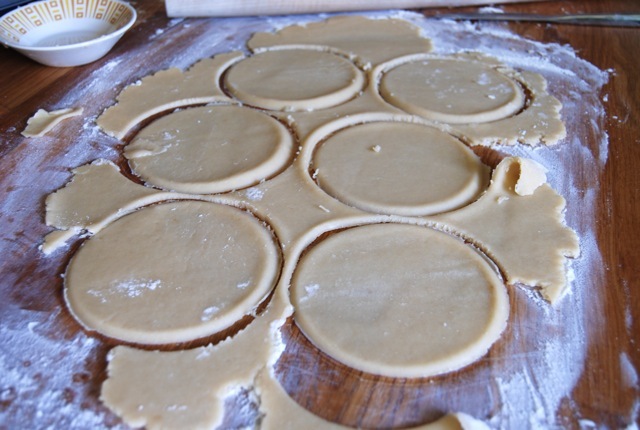 If you’re lucky enough to have an large (roughly 4-5 inch) round cookie cutter – great! Otherwise, do what I did and use a bowl. 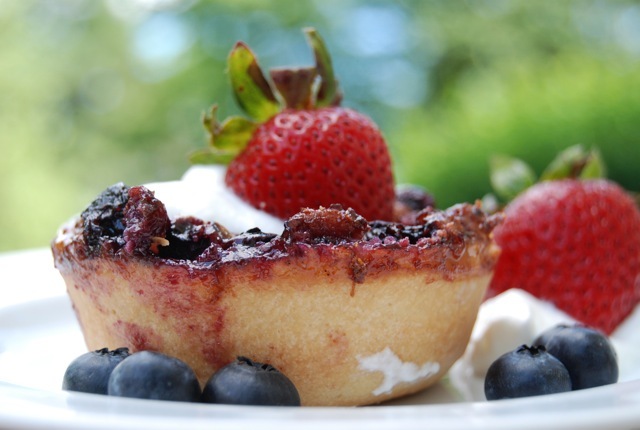 Cooking and yes, even baking, is as much about improvisation as anything, and these tartlets are a great, adaptable recipe. Don’t have a jumbo muffin tin? Use a standard-sized pan and make 8. Or pull out some fancy tart pans and go to town. Best yet, ask a friend or your kids to help. It’s simple, hands-on recipes like this that invite fun and creativity and make memories that last a lifetime. Recipe adapted from Whole Foods. Preheat oven to 375 degrees. Butter 6 cups in a jumbo muffin tin; set aside. In a food processor, combine flour with 1 tablespoon sugar. Add butter and pulse until mixture resembles coarse meal. Add 2 tablespoons sour cream and 2 1/2 tablespoons cold water and pulse just until mixture starts to come together. On a floured surface, roll out dough into a (roughly) 8×16 inch rectangle and cut into 6 (4-5-inch) circles. Line muffin cups with dough, pressing dough up the sides of the cups and pressing together any tears. In a medium bowl, whisk together 1/3 cup brown sugar, remaining 1/2 cup sour cream and eggs; divide evenly between the muffin cups. Arrange fruit in custard (some will stick out). Sprinkle with nutmeg and remaining tablespoon sugar. 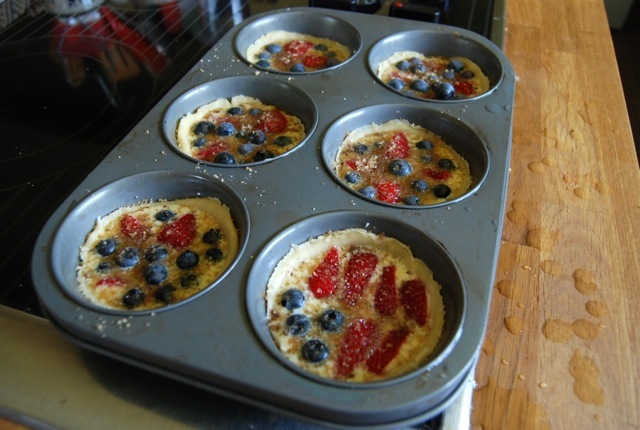 Place tin on middle rack in oven and bake until pastry is golden brown and fruit is tender, about 45 minutes. 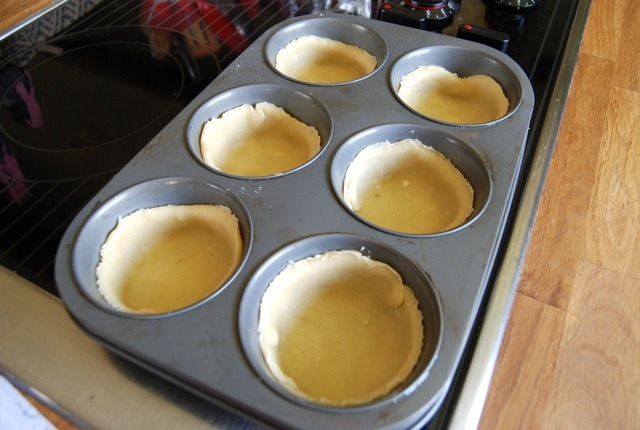 Run a knife around the edge of each tart to loosen them; immediately transfer to a wire rack to cool slightly. Serve warm or at room temperature. Garnish with whipped cream and fresh fruit if desired. 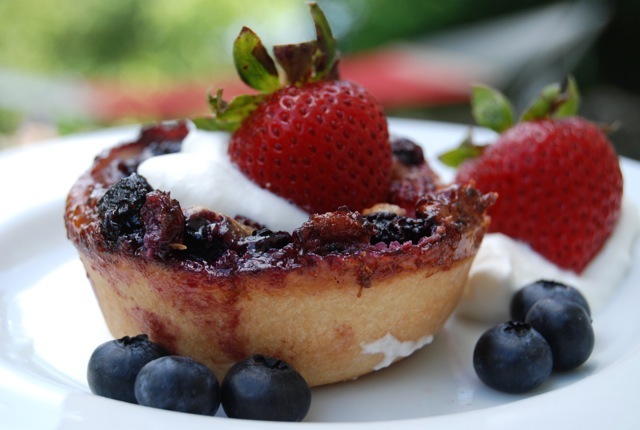 This entry was posted in Dessert, Holiday baking, Holiday ideas and tagged Happy 4th of July!, Whole Foods. Bookmark the permalink. Quick! Someone create a diversion so I can steal that tart! Looks pretty to me! What’s neatest is seeing all of the fruit go in so raw-looking and come out all gnarled and SO MUCH MORE DELICIOUS. Hey, are you not posting your updates to Twitter anymore? I never see them! Yummy!!! Hope you have one for me. Enjoy your holiday.